Papafox (with hat) and Iceman shown in Hawaii, ready to visit the “upper 49” states. Estimated departure date is last week of July, 2015. We’re doing this trip to: have fun, show that crossing continents in a Tesla is now a reasonable endeavor, and suggest tricks-of-the-trade for easier cross-country driving in an electric vehicle. Iceman is a 10 year old Portuguese Water Dog, originally from Australia. He still barks with an accent. Hobbies include swimming and smoozing the lady dogs. Sounds like you are on an awesome adventure. One of your neighbors posted this on GM-Volt.com. 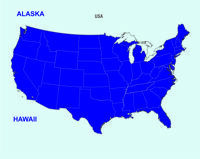 We’re all curious how you are able to drive from Hawaii to the continental US, and also how you’re going to make it up to Alaska. LLninja, Looking forward to getting started in mid-July. A big decision yet to be made will be whether to ship the new Tesla 70D to Hawaii at the trip’s conclusion or retain my current 40kwh version of the car, which is already in the islands. There’s a nice string of superchargers leading toward Edmonton, Canada, but the route to southern Alaska will require much slower recharging methods. Interestingly, I had already picked out a route when I spoke with Michael Fritts and discovered we not only had the same Alaskan destination, but we both planned much the same routing to get there. Thanks for joining us on this adventure! Keep in touch if you are considering selling either – my boss might be interested. Hindsight being 20/20 I wish I knew about the tesla model S 40 and had an order placed with the initial batch as I understand it really is a model 60 with a software lockout to only use 40 out of the battery, so it’s upgradeable to a 60 in the future for a little cash. Enjoy the trip, sounds like an adventure of a lifetime. Both envious and excited for you and iceman as you start your journey soon in your new Blue Tesla! Safe travels while all of us back here on the islands live vicariously through your road trip adventures! Nanimac, I hope to start a tradition of Hawaii Tesla owners picking up their cars on the mainland in early summer and enjoying a grand adventure before shipping to the Islands. Also, your car is absolutely perfect for a long mainland road trip. Maybe this blog will give you the itch and we’ll read about your mainland road trip next year! I always thought I’d buy a European car and then drive from Germany into France Spain Portugal, Italy, Switzerland and finally off to the port. Why should the Audi and BMW buyers have all the fun? For us, a mainland adventure can indeed be an odyssey. Hmmmm…maybe a Model X tour next? Nice meeting you and Iceman on the beach today. Our PWD pup enjoyed meeting Iceman. Best wishes to you and Iceman on your adventure! Thanks for sharing your adventure with the Boise, Idaho owners and EV enthusiasts today. All the best on the trip. It was hot today, but Iceman is cool and so is Papafox. All the best. Kunal, a HUGE thank you for your help in putting this gathering together. It was fabulous. Iceman and I have found cooler weather in Seattle and we’re staying here until we can get the blog caught up. It was nice to meet you in Delaware. I love my Tesla and I love my PWD so I know you are having the time of your life. Safe journey! Nice meeting you too! Iceman has been a terrific traveling companion. He’s enthusiastic to start the road trip each morning, and he’s good and ready to get out and walk around with each charging stop, just like me. Wishing you delightful traveling adventures too. Papafox – any plans for the summer of 2016? I just updated the blog. Plans for the summer are hinted in a photo.